More and more of you will be getting Windows 10 Creators Update in the coming days and weeks. Creators Update is a major features update which started rolling out on Tuesday April 11, 2017. Microsoft is delivering this update in measured doses, presumably so as not to overwhelm its download servers. It’s no secret that Microsoft wants to replace Control Panels with the Settings app, but the Settings app is still a work-in-progress. So, you’re still going to need Control Panel for some things, and we actually prefer using Control Panel for some things – like setting our default programs. In Windows 10 Creators Update (officially version 1703), Control Panel is missing from the Start button Right-click menu. There are no links to Control Panel anywhere. However, Control Panel lives on, we tell s ya! 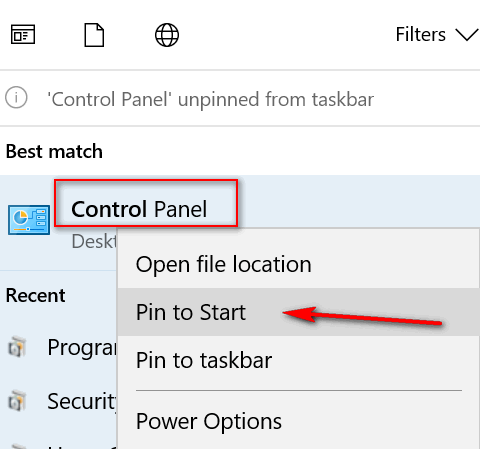 You can put a shortcut to Control Panel on your Start menu, desktop, taskbar or all three if you like — and it’s easy to do. First, to put a Control Panel shortcut on your desktop, one way is to right-click on an empty area of your desktop, choose “New” > “Shortcut” and type Control Panel in the “Type the location of the item” box. Then click “Next” and give it a name, we suggest “Control Panel” :). Another way you can put a Control Panel shortcut on your desktop (as well as other useful shortcuts) is by going to Settings > Personalization > Themes > Related settings > Desktop icon settings. 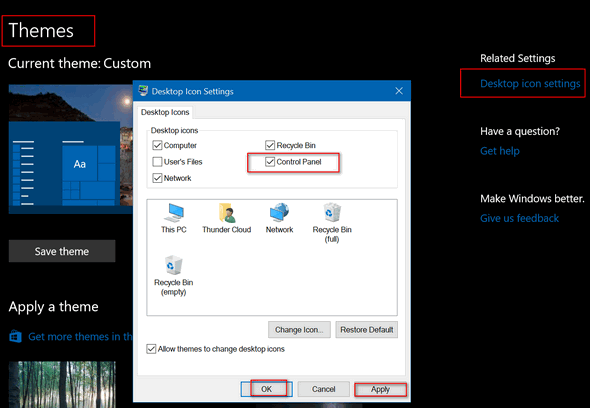 When you click on “Desktop icon settings” you’ll see the Desktop Icon Settings dialog appear. Tick the items for which you want desktop shortcuts (Computer, User’s Files, Network, Recycle Bin, Control Panel) and click “Apply” “OK” and that’s that. You can add Control Panel to your Taskbar by opening a run command – Windows Key + R and typing Control Panel then pressing Enter. When Control Panel opens, right-click on its icon in the taskbar and choose “Pin to taskbar”. 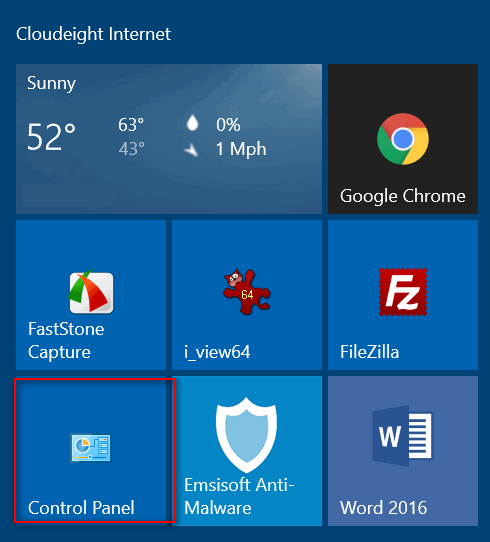 If you want Control Panel on your Start Menu and your Taskbar here’s the easiest way. 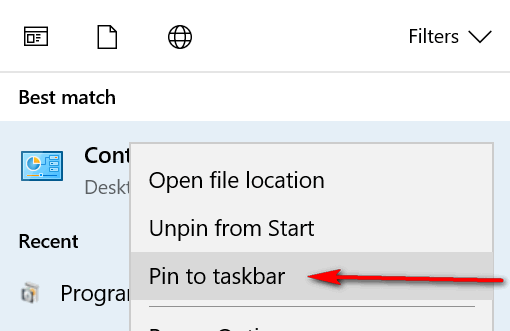 In Cortana (taskbar search) type Control, when “Control Panel (Desktop app)” appears at the top, right-click it and choose “Pin to Start”. After you’ve done that, type Control in Cortana (taskbar search). When “Control Panel (Desktop app)” appears at the top, right-click it and choose “Pin to Taskbar”. And if you did that correctly, you’ll have Control Panel on your Start menu and your taskbar – and you can move the shortcuts around by dragging them until you have them right where you want them. And on my taskbar, too! Yes, I use that Settings app for some things also, but I learned my leasson trying to set default programs from there. It is fine for a rainy day when you have nothing else to do but resetting your defaults over and over again. Thank goodness for the Control Panel. I have 4 computers in our place with windows 10. They’re all connected to the HomeGroup. When I updated from 1607 to 1703, only two of them recognize each other now. The other two says: There is currently no homegroup on the network. They only have a button to Create a homegroup, instead of Join now. (Not too happy with 1703) I’ve seen you help many people over the years. Would you have any suggestions how to fix this one ? I’d appreciate it. First try running the Windows HomeGroup Troubleshooter… In Windows 10 Version 1703, Windows consolidates Windows troubleshooters into one settings page. As you can see above, one of the troubleshooters is named “HomeGroup”. While sometimes troubleshooters don’t work well, they do work many times and in your case it’s the first thing you should try. Keep in mind that you will have to run this troubleshooter on every computer that’s part of your network. Press the Windows Key + i key to open Settings. In settings click on “Update & security”. Click on HomeGroup to run the HomeGroup troubleshooter. Wait while the troubleshooter scans and hopefully resolves your problems. 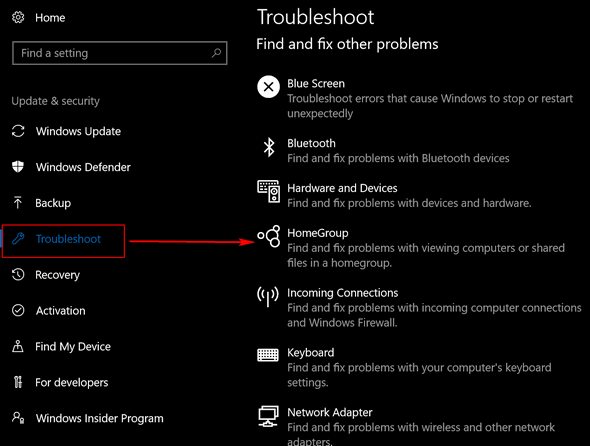 Reminder: You’ll need to run this troubleshooter on every PC that is part of your network. There are more complex solutions but they are risky – and I ‘m not going to recommend them. If the troubleshooter does not resolve your problems, I’d recommend rolling back to the previous version of Windows. Yes, all four computers are updated to 1703. I did run the troubleshooter on all four computers, and no luck. It mentioned that the computers must have synchronized clocks. And they are. (Might be off 1 or maybe 2 seconds at the most) Troubleshooter can’t identify the problem. I wonder if other people are experiencing this problem with 1703 ? I am not seeing much of anything in the way of networking problems or Windows HomeGroup issues. That’s not to say there are none,but normally when a lot of people have a problem with a new Windows update, they don’t hesitate to make it known. Computers are logical and precise. While one or two seconds means nothing to us human beings, one or two seconds is a big deal to computers that measure time in microseconds if not nanoseconds. Why don’t you try doing this on each of the four computers. Control Panel\Clock, Language, and Region and click on “Date and time”. In the dialog that appears, click on “Internet Time”. Click the button that says “Change settings”. 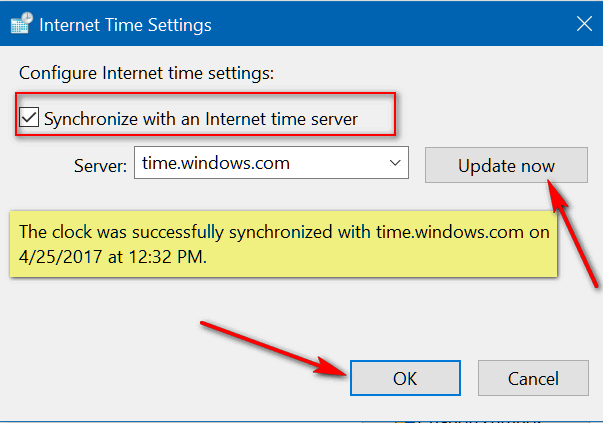 Under “Synchronize with an Internet time server” (time.windows.com will be pre-selected – that is fine (or you can choose any of the time servers by clicking the down arrow) then click “Update now”. You’ll get a message that Windows has successfully synchronized your computers clock with the Internet time server. You’ll have to do this on all four PCs – then try the troubleshooters again. Remember, as the hours pass, each computer will be synchronizing automatically with an Internet time server, but they all won’t be synchronizing at the same time – so a second or two difference in clock time would be normal. But a second or two might make a difference when running the troubleshooter. I think it’s worth a try to sync the clocks on all 4 PCs then run the Troubleshooter again on all 4. I synchronized the time on all four computers. Ran the troubleshooter again on all 4. Still no luck. I even went into Services-HomeGroup Listener (which was stopped) Peer Networking Grouping-Peer Networking Manager & started all three. Still couldn’t find the HomeGroup After re-start, they changed back to stopped by themselves. I guess I might have to wait for another major update (which might be a while) to get all four back on the HomeGroup. Microsoft might fix this bug eventually. ( I won’t hold my breath on that ) But thanks for your help. I appreciate it. It was worth a try. Keep on keeping on, Ken. That info is months old and featured by many tech sites. We featured this same information last May see this post. Just so everyone knows: Control Panel is being slowly replaced by settings. If you follow the tip above, there’s a good chance you’ll have to do it all over again if you upgrade to the Fall Creators Update in September.